Mama Cornish: Making The Most Out Of Small Bathroom Spaces. Making The Most Out Of Small Bathroom Spaces. Making the most out of small places can be quite the challenge. If you're not making the room too dull, you're making it look too crowded and making the space look even more smaller then what it is. We have quite a small bathroom here at home, and so, to maximise the space and to get the most out of our bathroom, we've been making mood boards to show how we believe we can make the most out of our bathroom. Too often I see plain white bathrooms, with white accessories and wonder why you would want every single item in your restroom to be white? Although I'm not too comfortable wearing bright colours, or colours at all in that case, I do love splashing the colour around my home, even in the bathroom! However, when I'm having a nice relaxing bath, I don't want to be staring at bright pinks, yellows and oranges, instead I want calming colours, but I also want it to be stylish. Having cream featured nearly everywhere in my home, I understand why so many bathrooms are white, but that doesn't mean I want my bathroom to be white. 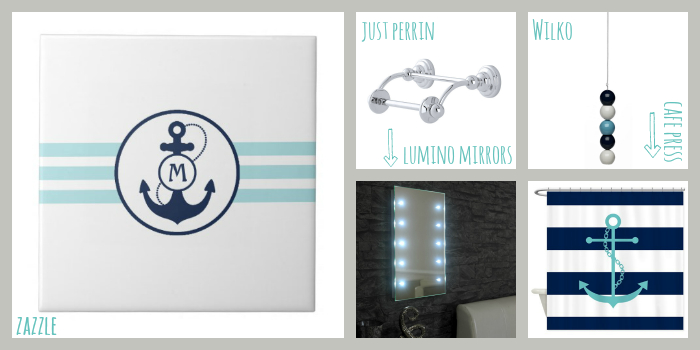 I'd paint my bathroom a nice pale teal colour, and accessorise with white and other coloured accessories such as the items featured above! I should've mentioned previously that I live by the sea, and the nautical theme has become a theme I well and truly love, but surprisingly I don't have any nautical themed rooms or even accessories in my home (yet!). I'd love to jazz things up a little and make it a stylish but themed bathroom, I love the silver style toilet roll holder due to it's unique shape, but sadly don't like the price tag attached to it! On the other hand though Lumino mirrors do these illuminated mirrors for your bathroom at a steal grabbing price like the one pictured! Although we don't have a shower, I'm thinking of putting a shower curtain up to maximise the small space of the bathroom. It won't take any space away, but will instead add colour as will the light pull which is a steal at just £2! Who wants a plain old white cord? Me previously, until I hit a certain age and vowed I'd add more colour into my life! Last but not least, the beautiful bathroom tiles with baby teal stripes going across them would look beautiful as a middle row of tiles! They also have the letter M right smack bang in the middle, which is my initial, so I and other members of the family would always know that it was me who decorated and gave the wonderful bathroom makeover!